Here in the West, it’s implied that tattoos are meant to be seen – and most are. They’re images, works of art, by their very nature visual. We photograph them, share them on social media, and scroll through galleries of flash/hundreds of pics, but what about the unseen? Those ones that are hidden away at work or around family. But you have them, just the same. The pieces that people you see every day don’t know you have. Just for you – and those close enough to you to see you in the buff. If you’re picturing a cute, little heart, thinking, “Yeah, that might work for someone with a tiny tattoo somewhere that doesn’t show,” imagine that no one in your personal or professional life knows you’re tattooed, but you have a full body suit with sleeves, like a tattooed vest, under your shirt with only an untouched trail of skin down your chest, so you can unbutton your shirt in a stuffy room. 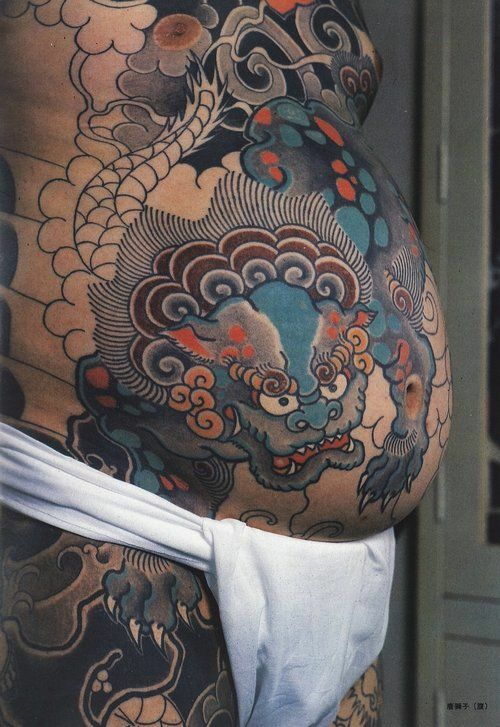 This is the culture of irezumi, or traditional Japanese tattooing, and the Yakuza have made it famous. If you’re looking for an inspiring Yakuza origin story here, you won’t find one. In reality, even the Yakuza argue how the Yakuza began. The problem with nailing down its origin? It’s been around since the 1700s. So while some believe the organization was begun by shady merchants, others argue that the gang was founded by samuri. Still others say it was a group of gamblers. The gamblers have a theory since ya, ku, and za are the numbers 8, 9, and 3, which is also a terrible hand in the popular card game, hanafuda. But, if they’re right, what was originally a term for a lousy hand of cards was quickly turned against them to imply that they were worthless as well. 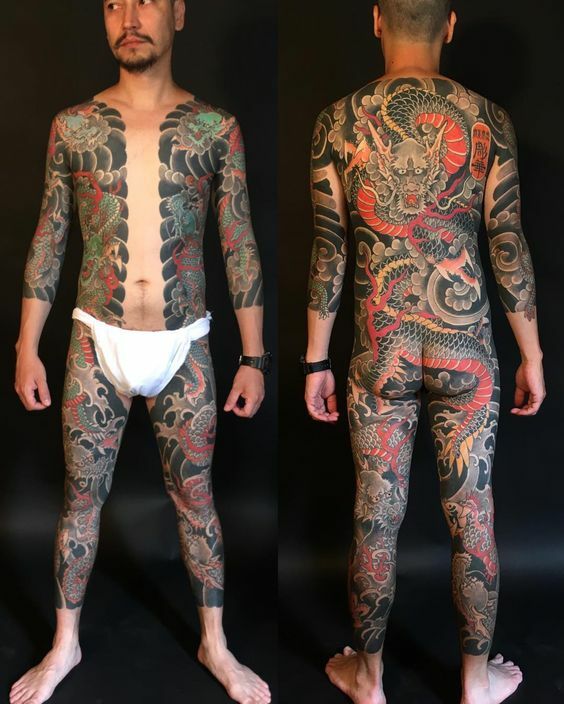 So much so that when Sega created the Yakuza game series, they hired actual Japanese tattoo artists like Horitomo to design the body art for the characters. But what’s interesting is that Sega also captured the metaphorical storytelling element of Japanese tattoo culture. The series begins with the game Yakuza 0, and shows the characters Kazuma and Akira with only the black outline, or sujibori, of their back pieces, symbolizing the beginning of their journey and their tattoos fills in as the game progresses. 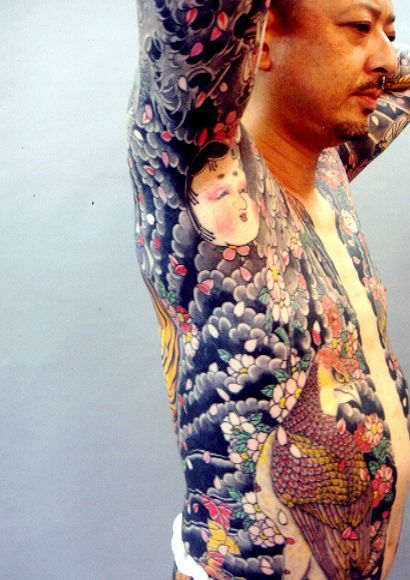 Still, in Japan tattoos are so heavily associated with crime that they’re losing popularity, even in the Yakuza. As recently as 2012, Toru Hashimoto, the mayor of Osaka, forced government workers to admit their tattoos and either remove them or find work elsewhere. Swimming pools, bathhouses, and hot springs or onsen don’t allow tattooed patrons, either. After all, tattoos got their start in Japan as a way to mark repeat criminal offenders on the forehead and arms. Whether the organization is a Robin Hood of the people or cold-hearted, mafia gangsters, I’ll leave up to you, because the fact remins that Yakuza has undoubtedly created something both beautiful and mysterious from those early punishments – though their association with body art has only helped to instill the criminal association. Irezumie is full of symbolism and also gives us an inside peek at the Yakuza’s values. But to catch this glimpse, we must revisit the storytelling aspect – and the legends that inspired their most popular designs. The ancient legend of the koi tells of a golden school of the fish swimming upstream the Yellow River. The group fought its way against the current, only to find a waterfall raining down on them. Of course, many gave up and slipped off back downstream. Those that kept propelling themselves out of the water and up the downpour drew the attention of demons who taunted them and raised the waterfall higher. After a hundred years of struggling to climb the rushing water, one of the koi finally reached the top of the falls and the gods honored the koi’s perseverance and tenacity by turning the victorious fish into a golden dragon, a symbol of power and strength. Of course, the color of the koi also has meaning. As in the koi story, Japanese dragons are associated with strength and bravery and they ruled the oceans and skies as water gods that could shapeshift into human form. They are seen as benevolent protectors of humanity and their color can symbolize additional traits such as black for wisdom and yellow to show loyal companionship. In addition to color, there are six specific dragons commonly represented as tattoos and each has as unique a purpose as a Catholic saint. For instance, Fuku is the bringer of good fortune while Ri has exceptional vision. But there’s also the position of the dragon and its relation to other elements in the tattoo to consider. An ascending dragon represents progress while a dragon and a tiger together might symbolize a reminder of brains over brawn. The phoenix came to Japan by way of China and is the mythical bird said to be reborn through fire and rise again from its own ashes. According to legend, these birds come to earth to do good deeds and can only be seen during times of peace or to mark the beginning of a new, prosperous era. Because ancient artifacts depicted the phoenix and the dragon as fierce lovers, the two together symbolize simultaneous conflict and marital bliss. In Japan, snakes are seen as symbols of health and regeneration and are believed to protect from bad luck and illness. People born in the year of the snake in the Chinese zodiac are thought to be philosophical and exceptionally bright, though stubborn. Just like the blossoms themselves, known as sakura, these tattoos serve as reminder that life is beautiful and fleeting. They vanish so quickly after falling that hanami or flower-viewing celebrations are held to bring family and friends together to enjoy the fragrant blooms before they disappear. These horned ogres or demons are usually pictured with tusks and are responsible for punishing evil on earth. Oni are born of wicked human souls, transformed in hell, and sent back to torment, remove the skin from, and crush the bones of the depraved. They often carry iron clubs to crush humans with for fun. Though tigers are not native to Japan, they are still a popular image when it comes to Japanese tattoos. Tigers are associated with the element of wind and the season of autumn and can therefore control the breeze. Tiger tattoos are also believed to ward against disease, bad luck, and demons, like the Oni we talked about. Foo Dogs are also known as the Lions of Buddha and are often seen in pairs, known as komainu, guarding the entrances of Buddhist temples. Because of this, they’re often tattooed in pairs as well and are thought to protect against evil and danger. Many times one will have its mouth open while the other’s mouth is closed as a form of Buddhist symbolism that these guardians are together forming the a-un sound, representing the beginning and the end. Just as the lotus flower begins its life at the bottom of the pond and must rise out of the muck to bloom at the water’s surface, this metaphorical tattoo symbolizes the triumphant struggle to reach one’s full potential. 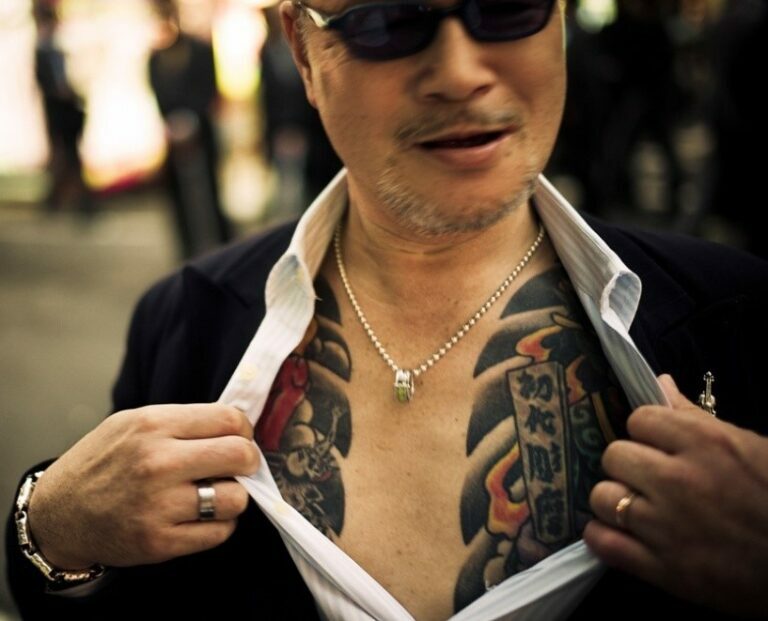 Whether the Yakuza is seen as benevolent or a blight, the symbolism of their tattoos carry heavy metaphors not typical of other criminal organizations. It’s certainly dissimilar from Russian tattoos (link to post) that typically display accrued criminal activity and prison punishments. 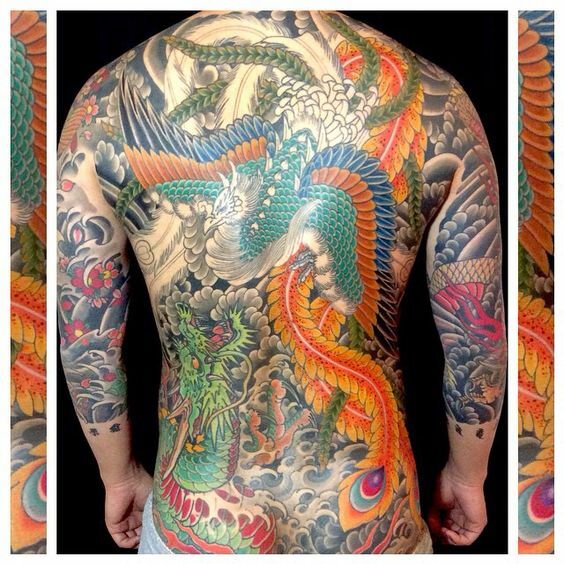 But aside from meaning, what makes the tattoos of the Yakuza stand out is their dedication to keeping them hidden – and there’s a mysterious beauty in that. “In Japanese culture, we depict the light by exploiting the shadows,” Horiyoshi explained to Vice, “The shadow of the buddhas are more important than the faces of sculptures. People get tattoos here knowing they won’t be showing them off all the time and that’s why we don’t take our tattoos lightly. Our spiritual culture is different from other countries because when we show our tattoos, it takes the form of a mysterious light that’s hidden and beautiful. That’s why it’s fascinating.